Many of us know people who go beyond everyday cycling and incorporate cycling into as much of their daily lives as possible. For some, cycling is their recreational passion and you will see them out on road bikes every chance they can get, either alone or riding in clubs like Peterborough Cycling Club. Others integrate cycling into their daily routine, commuting to work, getting back and forth to school or using their bikes for short trips and shopping. Those that are really committed include cycling into as many aspects of their lives as they can: recreation, daily travel and their job. One such person is Jeffrey Macklin of Jackson Creek Press. Whether it is riding Peterborough’s fabulous trails for pleasure, picking up groceries for dinner or meeting a client to discuss a new project, you’ll find Jeffrey on his bike. And when it comes to work, he doesn’t just stop at using the bike to run his business. 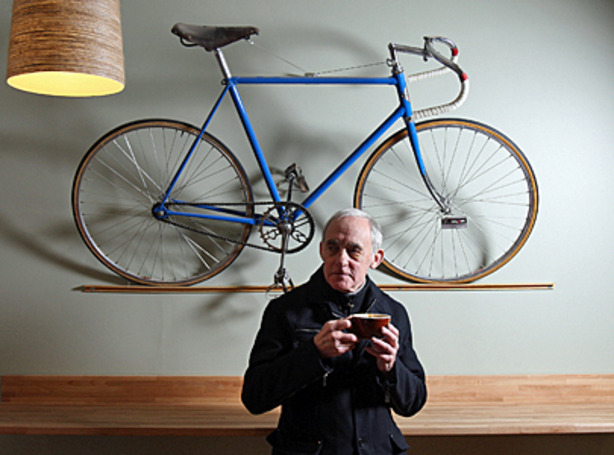 As a printer of many fine products, bikes make his way into many of his design ideas. Jackson Creek Press is an old school letterpress print shop. Unlike modern print shops, which use recent digital methods and printing processes invented since about 1900, everything in Jeffrey’s shop is created by one process: ink getting squeezed onto paper by some kind of pre-shaped, raised surfacea printing technique that has been around for thousands of years. You can think of it as the professional version of the potato prints you made in kindergarten. Letter shapes are created from individual metal or wooden stamps, one for every letter. Graphic images are created from woodcuts, linoleum engravings or other manual processes. To create an image, be it blocks of letters or graphic designs, Jeffrey has to painstakingly and methodically place every piece of the image in exactly the right place on the pressin reverse and one colour at a time! Unlike modern printers, such as a typical laser unit, Jeffrey’s printed products are very rich and tactile. You can feel the ink that has been pushed into the paper by the printing press. The results are just beautifuljust like any fine artisanal craft. Jeffrey is passionate about improving cycling infrastructure and culture in Peterborough. “I see some good things happening and in the future for the cycling scene in Peterborough. Susan Sauve and her team at City Hall are thinking in a progressive way, and if we get their ideas implemented, we will be moving in the right direction.” He does note a few somewhat unique Peterborough aspects to local cycling infrastructure. “I always laugh when riding down George Street—when outside of commuting hours, bike lanes are parking lanes. That ways strikes me as odd – shared parking/bike lanes.” Jeffrey is a big promoter of local bike culture on social media. You will see many #bikeptbo posts on his twitter and Instagram feeds. You’ll find Jeffrey cycling around town at all hours and in many locations. In winter and when off road, you’ll see him aboard a Trek Mountain bike he purchased at Wild Rock Outfitters and in the summertime he is found aboard a classic CCM 10 speed he picked up at Lumpy Bikes. If you see him around town, see if he has time to stop and chat about living the bike life. Better yet, if you want some great bike art in your life (or you know someone special who does), give him a call at Jackson Creek Press. And you can always take time to look up his latest post under the #bikeptbo hashtag.